Calder covers all the bases: an ends-in-r surname with artistic and athletic sides. Could this be the next Jackson? 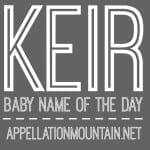 Thanks to Kelli for suggesting our Baby Name of the Day. Calder appears as a surname and a place name, but the origins are debated. The name might mean calf valley, from Old Norse roots by way of Scotland. In Welsh, it comes from their words for hard water. 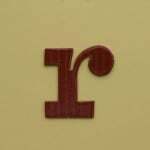 Or possibly it derives from two words meaning wood and stream. I long hoped that it would share ties with caldera, the Spanish word for cauldron. In English, calderas form on a volcano, a cauldron-like depression created by an eruption. But it looks like that’s just folk etymology. So we can’t count this one among modern nature names like Ridge, and yet reasons to love this name abound. Frank Calder served as founding president of the National Hockey League, a role he held from 1917 until his death in 1943. The rookie of the year award is named in his honor. So is the Calder Cup, the equivalent of the Stanley Cup for American Hockey League teams – the level of play below the NHL. 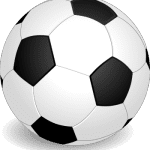 Maybe Canadians make the connection immediately, but few Americans would see this name as tied to the sport. Still, the connection will likely appeal to at least some parents. When Canadian Olympic Meaghan Mikkelson welcomed a son in 2015, she chose this name for her son. Husband Scott Reid also played hockey; Mikkelson’s uncle won the rookie of the year award and her dad played for the Springfield Kings when they won the Calder Cup in 1971. The second famous bearer might be more widely known: Alexander Calder, creator of giant mobiles. Alexander came from a famous family of artists. His grandfather – another Alexander – sculpted the William Penn statue that stands atop Philadelphia’s city hall. His dad also built a following in the City of Brotherly Love. But large-scale kinetic sculptures made the younger Alexander famous. He also crafted large, abstract installations he called stabiles. Trained as an engineer, he was uniquely able to create such massive works. Many were commissioned for public spaces and remain on display today. Beyond the artist and the athlete, there’s a Scottish clan by the name, from the area around Iverness. That makes this one an excellent Scottish heritage pick. Just like many surnames, we can find a small number of children given the name over the years. In 2010, the number stood at 65. In 2012, it sat at 61. Maybe Mikkelson deserves credit for putting this name on parents’ radar. In 2016, 120 boys received the name – a new high. Or maybe it comes down to our affection for ends-with-r names, like Carter and Hunter. Friendly nickname Cal probably helps, too. Actor Hill Harper played a character by the name on USA’s Covert Affairs, and author Calder Willingham wrote the screenplay for The Graduate. For now, Calder remains quietly under-the-radar. With an on-trend sound and plenty of positive associations, all it will take is one well-known bearer of the name to push this one into the spotlight. What do you think of Calder? Would you consider it for a son? Originally published on April 3, 2014, this post was revised substantially and re-posted on November 1, 2017. We named our son Calder and we love it.. so different yet not made up sounding. Fits him perfectly! My daughter born in June 2015 is named Calder. Since we waited until birth to find out if the baby was a boy or girl, Calder was the name we had ready for the baby. It was inspired by a biology professor my husband had who encouraged him to become a biologist, and the meaning of the name, rocky water, felt appropriate for this baby who gave us a few scares during pregnancy. It’s a lovely name for a girl and it seems very fitting for our little lady. Our son loves calling his sister Calder too. What a great story, Annie – thank you for sharing, and congratulations on the arrival of your new daughter! I named my son Calder after Alexander Calder the sculptor and painter over 14 years ago. I had chosen the name years before he was born as I am an art teacher and an admirer of Calder’s work. I wasn’t trying to do the “Jackson” thing at all and wanted my son to be able to look up this artist and have pride in the man I named him after. Plus, I just wanted a creative name that no one else had so my son wouldn’t have our surname initial tagged to his name. There’s a character called Kalder in The Circle by Dave Eggers. I think that book is getting pretty popular. Ha! It’s my maiden name, so it sounds odd to my ear as a given name. If we had a second boy, his middle name would absolutely be Calder. And Liz, we’ve always said it callllder, never with an o sound. Some say Calder where the a is more an old sound. Is this the KOHLER version or CALLDER? I think Calder is so handsome. 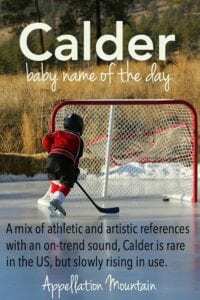 Sadly, my husband has a friend who’s last name is Calder, so using it on a son would seem a bit awkward. A friend of mine has a little boy named Calder. He was named after Alexander Calder, the sculptor. Calder has a twin brother named Everest. I think they make a great twin set of names.